Like most other people, when I first began taking yoga, the focus was entirely on myself, and I just wanted to enjoy the class. But as time went on, I realized how important it was to connect to the others in the room as well. Regardless of how we feel about it, how we conduct ourselves has a direct effect on those around us. Yoga, being an ancient tradition, has a certain amount of etiquette on it’s own. I thought these practical tips would give you a “heads up” on what to expect. With all of life’s distractions, it’s easy to be late to your practice. Dishes in the sink, an unmade bed, phone calls to return; the list can go on and on. Try just for yourself to be on time so that you don’t have to walk on top of people to find your place in the room. Leave your socks, shoes and worries outside the door and set up your mat in a calm, quiet, and peaceful way. Leave all appointments, chats and work related correspondence be for one hour. Once you are in the classroom, you have to truly connect to yourself and trust that you are supposed to be there. Whether you’re a businessperson waiting on a deal, an actress waiting on the call of a lifetime, or a Mom with kids waiting for you at home, these things will all be there when you are finished. 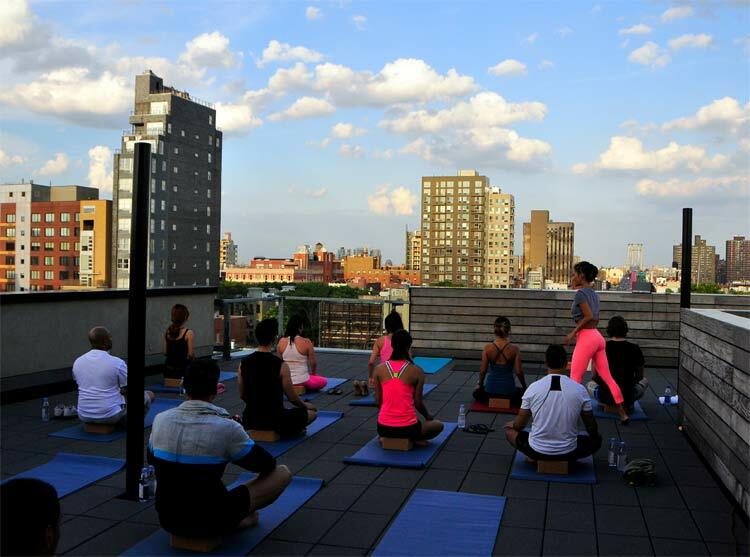 Yoga class is just for you – a time where you can truly connect with yourself. 3. Where Do I Place Myself In The Room? The best position for yoga is to face North or East where positive energy flows -- though this isn’t always an option in crowded cities where space is an issue. A good rule of feet is to not point them toward your yoga Instructor. In some cultures, feet are considered unclean so this could be offensive. Also, you should never step on someone else’s mat. The mat is the person’s private area to practice on and you should respect their space. Try to stay quiet and peaceful in class. If you must speak, do so softly. While practicing yoga, especially in busy environments such as a major city, you will often find yourself elbow to elbow with your neighbor. Try to ignore other people’s sour moods and create your own calm personal space. If a yoga Instructor didn’t ask you to help someone, don’t assist, even if you’ve been studying your entire life. You don’t need to take over their class, they earned their space and it should be respected. Savasana is a restful, peaceful pose where you relax with your mind and your body remains awake. It is done at the end of your practice and prepares you to go back into a world where there is no Savasana (peace), where your body will go into a completely different state. So take your time and relish in it for as long as you can.